Truckee-Tahoe Donner is the place to truly enjoy fresh air, blue skies, bright stars and beautiful scenery. Ski, board, snowshoe, ice skate, sled, tube, hike, shop, swim, fish, kayak, horseback ride, rock climb, raft, golf, boat, picnic, gamble or just lazing in a hammock gazing at our stars. 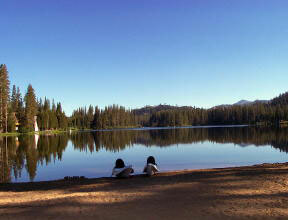 Contact Truckee Mountain Vacation Rentals to help you plan the perfect vacation.